As 2017 winds down, it’s time to set your sights on a spring break trip for next year or a summer getaway with the family. If choosing the destination is the thing holding you back, consider the Carolina coast. Cities like Myrtle Beach and the surrounding area known as the Grand Strand cater to families of all ages and groups of all sizes with amenities and accommodations you can’t find anywhere else. On top of the great features, the weather is pretty much perfect year-round. Once you see the deals you can get at Myrtle Beach’s Bay View on the Boardwalk, you’ll definitely close the tabs on the other destinations you’ve been researching. Just make sure you’ve got your credit card handy because, just like 2017, these prices will soon be gone. The sooner you book, the more you save – which means you’ll have more money left over to treat yourself while you’re living it up on the Grand Strand. Bay View on the Boardwalk goes the extra mile to make sure your room, suite or condo has all the comforts of home with added features that enhance the entire experience. The Sunset View 1 Bedroom Suites offer spectacular views of downtown Myrtle Beach from a private balcony, along with a cozy queen bed and modern bathroom. If you want to rise and shine, opt for an Ocean View Room overlooking the Atlantic Ocean and white-sand beaches below. To learn more about our wide range of accommodation types, visit our Accommodations page. Whether you’re looking for a relaxing experience or a thrilling time, the amenities at Bay View on the Boardwalk really make a splash. The resort’s oceanfront poolscape has laid-back features like a lazy river and a spa, as well as a kiddie pool, an indoor pool and an outdoor splash deck. 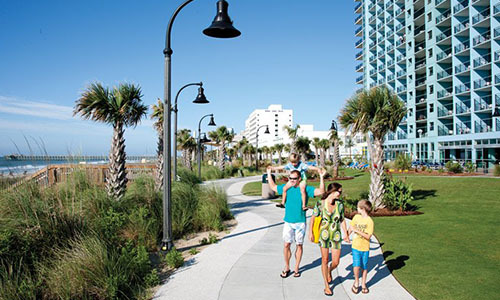 Or, dry off and play a game of giant chess or checkers, or head to the adjoining Myrtle Beach Boardwalk, home to pristine views of the coastline and access to your favorite shops and restaurants. To learn more, visit our Amenities page. One of the best things about spending your vacation at Bay View on the Boardwalk is its prime access to some of the Grand Strand’s most popular attractions. If the pools at the resort “wet” your appetite for fun, head to the nearby Myrtle Waves Water Park for an incredible afternoon in the sun. If you wish you could take some of the vacation vibe back home with you, pay a visit to the Hammock Shops in Pawleys Island to get the perfect addition to your backyard. Then, wrap up the day with oysters and drinks at the nearby Strong Waters Craft Cocktails & Kitchen. Learn more about the area by visiting our Explore & Plan page. No matter what type of trip you have in mind, set your sights on Bay View on the Boardwalk for an unforgettable trip in 2018. It offers many amenities in a prime location, all at a fantastic price. If you’re looking for a truly unbelievable deal, set a reminder for New Year’s Eve to take advantage of huge discounts on your spring or summer vacation stay. It’s an easy way to make sure your resolution to take an amazing vacation comes true.